Happy new year to everybody! We start into 2014 with some awesome new features. We are happy to announce that we finished our BitBucket integration. This enables you to log into VersionEye using your Bitbucket account as well as monitoring the dependencies in your Bitbucket projects. If you are new to VersionEye you can now signup with your existing BitBucket Account. Simply click on the “Login with Bitbucket” button on the right side. If you already have an VersionEye user account and want to connect it to your existing BitBucket account, simply go to “Connect” in the “Settings” area. Click on “Connect with Bitbucket” to connect your BitBucket account to VersionEye. It works exactly like our GitHub integration. Simply click “Show project files” on a repository and turn on the switch next to the project file VersionEye should monitor for you. The integration works totally seamless. 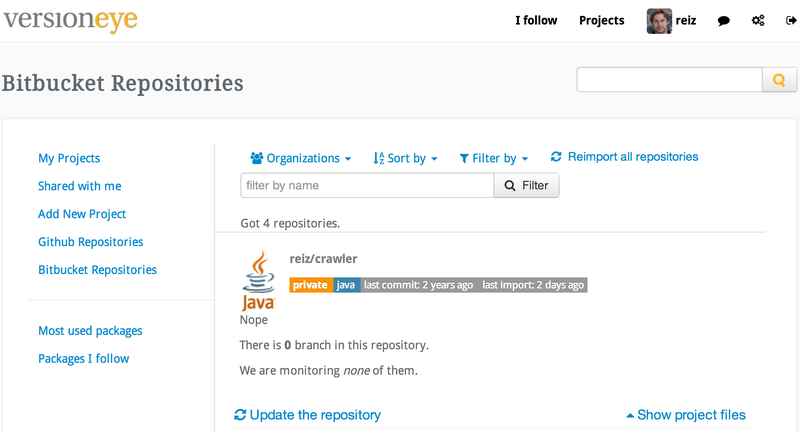 Just set it up once and you will get email notifications about out-dated dependencies in your projects. It was never easier to stay up-to-date with your open source dependencies. The Bitbucket integration is pretty new. If you find anything odd, please contact us and give us feedback.